Seeker’s Bad Science podcast examines James Cameron’s deep-sea classic The Abyss. The water’s not so fine in The Abyss. A close encounter with a mysterious force sends an American missile submarine plunging into a rift in the Caribbean Sea floor. An experimental undersea drilling rig gets commandeered to find the lost sub. The crew finds an alien life form at the bottom of the trench. A Navy SEAL officer on board starts cracking under pressure and tries to steal one of the lost sub’s nukes to blow up the aliens. There’s also a hurricane, a Cold War standoff, a love story … and did we mention aliens? In the latest edition of Seeker’s Bad Science podcast, host Ethan Edenburg takes a deep dive into James Cameron’s 1989 deep-sea mash-up of The Day the Earth Stood Still and Dr. Strangelove. 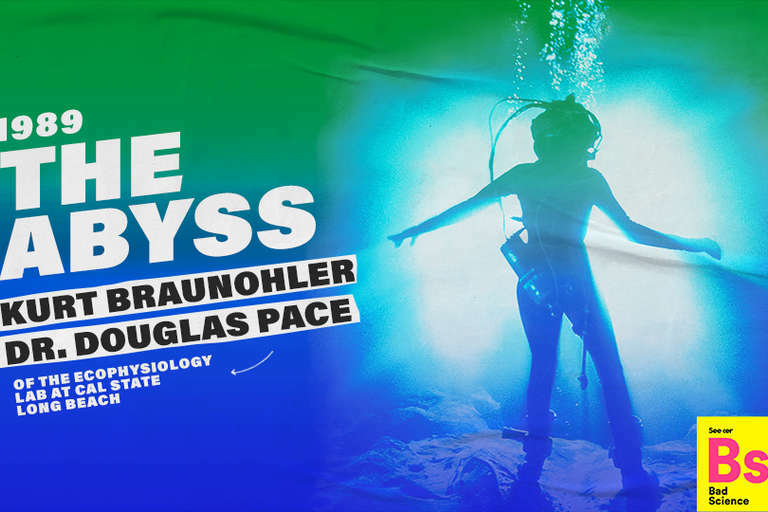 Joining him in the cramped quarters of the show are comedian Kurt Braunohler, an avid fan and diver, and Cal State Long Beach biologist Douglas Pace, who guides us through the science behind the cinema. “There’s been nothing else made really like it,” Braunohler says. It turns out there really is such a thing as high-pressure nervous syndrome, a complication faced by deep-sea divers — though it’s more likely to cause sudden motor and neurological problems than to make someone slowly go all Sterling Hayden. “If you don’t do something about it pretty quickly you’ll succumb and die from it,” Pace said. And could Mary Elizabeth Mastrantonio really be revived after intentionally triggering hypothermia and going 10 or 15 minutes without breathing? Maybe, but she probably would have “severe brain damage” as a result. Cameron, who also created the Terminator franchise and made the mega-blockbuster Titanic, is an accomplished amateur explorer in real life. In 2012, he piloted a submersible he commissioned and helped design into the deepest spot in the oceans, the Marianas Trench. His drive for accuracy took a toll on the cast, who had to learn to dive and spent several hours a day underwater in the grueling six-month shoot. And Cameron would refine the visual effects he used to create the aliens to produce the then-stunning “liquid metal” in Terminator 2: Judgment Day a few years later. What sea creature most closely resembles the aliens? What made Mastrantonio stomp off the set of one of the movie’s most intense scenes? And can Kurt tell real subsea outposts from ones Ethan made up? Hear those questions and more answered in this episode of Bad Science.